Both PowerWave 7.5 options are equipped with a high-efficiency chipset and internal cooling fan for fast charging -- and can charge through cases up to 5 millimeters thick, including OtterBox covers. Nomad recently released a second wireless charger -- this time, one that can go anywhere. The top of the Nomad Wireless Travel Stand is wrapped in slate colored leather from the Horween leather tannery in Chicago, a material used in many of Nomad's products. The dock itself is made of zinc alloy with a sleek, plain black design and features over-voltage protection and temperature control. It also can detect foreign objects -- and with two coils built-in, there's a wider charging area so you don't have to waste time finding the perfect charging spot. The dock has a USB-C connector, but if you already have a QC 3.0 wall charger, you can save roughly $20. Many of these seem needlessly expensive. 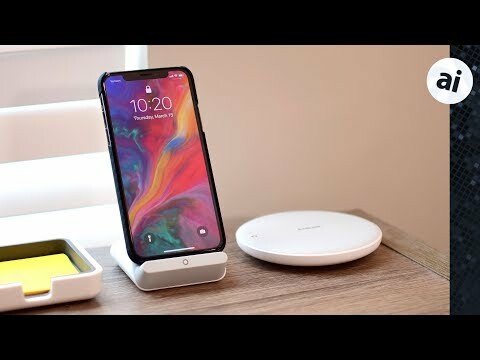 I bought two FS Labs Redwood Qi chargers for $25 each (one for the office and one for the bedroom) and they work brilliantly on my X. Look great too. FWIW: Got a $20 stand at BJ's. No AC adapter, just a USB cord. Stand is at a 45 degree angle, perfect for Face ID, which is something I need at certain times. I respect a website's need to route sales to Amazon, but, oy, the prices! And the focus on relatively expensive units is, well, regrettable. Does anyone make a wireless magnetic charging stand that connects to a cup holder? Got the Belkin one and it works fine but just patiently waiting for Apple to release the AirPower mat. Mophie for me until Apple’s AirPower mat becomes available. What am I missing- these are all 10watt chargers and the latest iPhone firmware allows for 7.5watt charging. So why are so many of them stated to only do 5watts only for the iPhone? The first one is a dead link. There are too many knock off products on Amazon to buy the Mophie charger there, especially for a laughable $2 discount. Some actual usability info would be nice. I have several of the Belkin Boost-Up charging pads and while they work, they are are extremely sensitive to phone placement - to the point where cabled charging is often more convenient. It feels more like a gimmick than a feature. Has anyone else had better experiences with other chargers? Not on mine, no placement issues. Seems to work exactly as intended. For night stand use don't get one that has a light especially those that pulse on and off. Can be really annoying in the dark. But a wireless angled stand is great. No more worrying about wires. Oops... looks like it was removed from Amazon. It was sold by Linear Trade.